NOW is the time to discover (or IGNORE?) the Uncanny Valley! Besides the fact that, as that article says “knowingly granting personhood status to entities that aren’t actually persons, we’re.. diminishing what it means to be a person”, that proposal seems to have a few limits. First of all, which Robots? 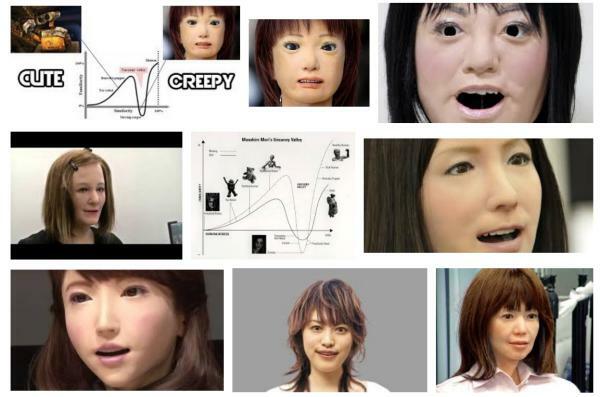 All kinds, or only those in, or beyond, the “uncanny valley”? Where do you draw the line between what is a robot and what is not? Above all: why robots? Should any personhood be granted to anything digital, that something it should go to software, or Artificial Intelligence, if you will. It hard to see why it should be granted to their mere interfaces, that is to objects which would be paperweights, if they had no software controlling them. See what I wrote about “robotics surgeons”: robots are nothing but software inside a box that more or less looks like a human body, or some part of it. What if a robot gets hacked, that is its software is replaced by another one? Seriously: let’s talk software, artificial intelligence, machine learning… Let’s talk of responsibility of the humans who make, configure or crack THOSE things. But not of “personhood of robots”. Giving personhood to robots risks to be like giving personhood to revolvers, or food processors. And this is where the “conspiracy” lies. « Quick: what is the FIRST thing that should be open to democratic control, and used for the common good?